In both its initial vocative and in its petition to be loosed from the need (necessitatem) that has fallen upon us, this antiphon initially strikes similarities with yesterday’s “O magne Pater”. However, it quickly starts to burn with greater intensity, both in its images and in its language—rather than the stately subjunctive request, ut aspicias in nos (line 10 from “O magne Pater”), Hildegard here uses more direct vocative commands: inspice… abstrahe… perduc (“Look upon… draw off… lead back”). 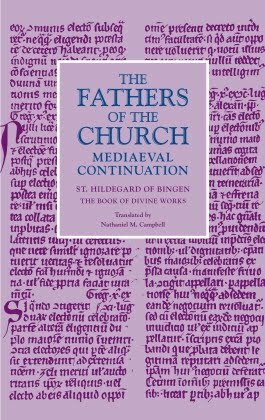 The imagery, too, is more Hildegardian: rather than simply “establishing us by the Word” (per quod nos constituisti, line 6 from “O magne Pater”), in this antiphon, God made us “in love…when first you bore your Son upon the primal dawn”. The dawn is one of Hildegard’s favorite images for the irruption of divinity into time, both in the beginning and then at the Incarnation (that is, at the two In principio’s of Scripture: Genesis 1:1 and John 1:1); and as we shall see later this year as we move into the Marian pieces in the Symphonia, it also becomes a favorite image for the Virgin’s God-bearing womb. For it was the Word, which before all created things had no beginning, and after them shall have no end, which summoned all created things into being. He brought his work into being like a smith causing his work to shower sparks (sicut faber opus suum fulminare facit). In this way, what was predestined by him before ever the world was, appeared in visible form. Therefore man is the work of God along with every creature. But man is also said to be the worker of the Divinity and a shadow of his mysteries, and should in all things reveal the Holy Trinity, for “God made him in his image and likeness” (Gen. 1:26). (…) And thus the vision mentioned above taught me and allowed me to expound the words of this Gospel and everything it speaks of, which from the beginning is the Work of God. It is this image—of God the blacksmith forging together humanity in the fire of his love, found also in the vision of creation in Scivias II.1—that I have allowed to inform my translation of the fourth line of this antiphon, which literally means, “that we may be [or become] the limbs…”. This connection to the Liber Divinorum Operum is likewise why I have chosen to accompany this post with the opening image from the Lucca manuscript of that work, showing Caritas (Divine Love) in her theophanic glory. For more insight into Hildegard’s use of love in this antiphon, we can turn to the music. As Prof. Beverly Lomer (of Florida Atlantic University) has recently admonished me, one must pay careful attention to the way in which the musical rhetoric acts as its own theological discourse, interacting with and refracting the meaning of the text set to it. As we listen to the piece and follow along in a transcription of the music, we see that Hildegard uses the same musical phrase, containing the highest note reached in the entire piece, twice: first with the second instance of the word, amore (in line 5 of the text), and then again on necessitatem (in line 9 of the text). The music’s language, then, connects the neediness that has overtaken us with the love with which we were first created. In yesterday’s antiphon (“O magne Pater”), the emptiness we felt was our self-imposed absence from the fullness of being, signified by God’s name. In today’s antiphon, the emptiness that we yearn to be rescued from is our self-imposed absence from God’s passionate love. This antiphon blazes with the intensity of that love as it creates us and then comes into the world to redeem us, to lift us out of the neediness into which we have fallen, to restore our membership in the mystical body of Christ, and lead us into the eternal happiness of salvation.